Which media giant offers investors more upside today? As two of the largest media companies in the world, The Walt Disney Company (NYSE:DIS) and Time Warner (NYSE:TWX.DL) compete on a number of fronts, most notably cable broadcasting and motion pictures. Though Disney shares have handily outperformed those of Time Warner -- and the S&P 500 index, for that matter -- over the last decade, the past 12 months have seen a reversal of fortunes, where Time Warner stock handily outpaced Disney shares. More interesting still, Time Warner and Disney are both in the midst of important shifts in the media landscape today, albeit in very different ways. Which is the better investment today: Time Warner or Disney? In this article, we'll run both companies through a three-part analysis to determine which stock appears more appealing right now. Disney beats Time Warner in several key measurements of its financial prowess. Here's a quick snapshot of several important solvency and liquidity measurements to use as a basis to guide this discussion. As you can clearly see, Disney carries more cash and equivalents and less total debt on its balance sheet. Its operations also produce substantially more cash than those of Time Warner, thanks, in no small part, to the House of Mouse's cash cow ESPN family of networks . The only category in which Time Warner beats Disney is its current ratio, though blue chip companies like Disney and Time Warner can virtually always tap into other sources of financing -- namely liquid investments or short-term debt markets -- to meet their funding needs. In a world that lives and dies by the phrase "content is king," Disney and Time Warner each enjoy meaningful competitive advantages by virtue of owning some of the most prized entertainment assets under the sun. Disney owns the rights to a seemingly invaluable trove of family entertainment assets, starting with Snow White and the Seven Dwarfs all the way through present-day favorites such as Pixar's Moana and Oscar-winner Zootopia. Moreover, success in its studio operations flows into the rest of its businesses -- including parks, resorts, cruises, syndication, and more -- in a virtuous cycle that has helped make Disney the largest media conglomerate in the world. Better still, Disney owns ESPN, easily the world's most popular sports network and the backbone of the traditional cable package. ESPN has come under some threat from subscriber losses related to cord-cutting of late, though it has largely been able to offset those with consistent contractual price increases. That strategy may prove untenable eventually, but Disney is undoubtedly one of the most important and iconic media companies anywhere. Similarly, Time Warner controls content assets and networks including HBO, TNT, TBS, CNN, Cartoon Network, Warner Brother Studios, and many more. Its ability to churn out high-demand content makes it, like Disney, a staple of the media landscape in the television and motion picture industries. However, I'd be remiss if I didn't touch on the most important storyline facing Time Warner today -- telecom giant AT&T's (NYSE:T) pending buyout of Time Warner. As part of the cash-and-stock deal, Time Warner shareholders will receive $53.75 in cash and another $53.75 in AT&T stock upon closing. With regulatory risk decreasing by the day, this deal will pave the way for AT&T and Time Warner to eventually create a new-age content-distribution platform in which cable content flows through mobile devices. Assuming it closes, this deal should help transform both the cable and telecom industries, and AT&T should enjoy an extremely strong competitive position in this new media order. Interestingly enough, the market currently places remarkably similar valuations on these two media giants. 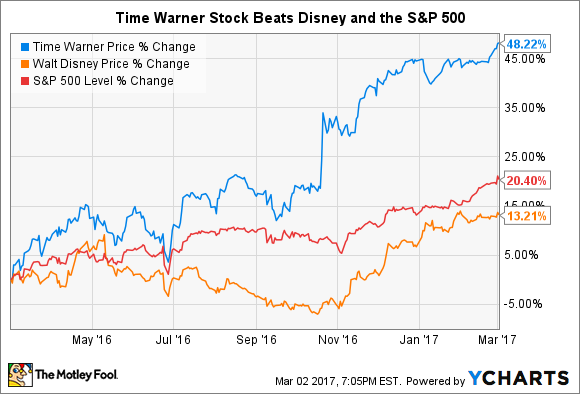 As a jumping-off point, here are three of the most commonly used valuation metrics for Walt Disney and Time Warner. It's hard to know where to start here, but this similarity makes sense since the companies are incredibly similar in terms of product and size. It does bear noting, though, that both Disney and Time Warner stocks currently trade at a discount to the S&P 500's garish 26.7 P/E ratio. Otherwise, there isn't a whole lot to say in this portion of our analysis. And the winner is... Tie! As you can see, both Disney and Time Warner are some of the top media stocks in the world today. Given the nearly identical valuation the market places on the two rivals, it's difficult to see a case where one truly beats the other in some meaningful way. Of course, Time Warner will cease trading as it is subsumed by AT&T, assuming its merger closes later this year. Beyond that, Disney and Time Warner are clearly two media powerhouses built to stand the test of time.